"Learn About The Benefits Of Denver Human Hair Wigs!" 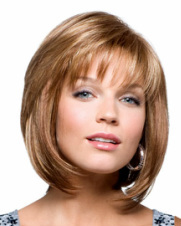 Human Hair Wigs are durable and can be matched to your own hair color and desired cut. They're also popular due to their natural feel and versatility. One of the best features of these human hair wigs is you can work with them as you would your own hair. You can style them using heat appliances (i.e., flat irons, curling irons, blow dryers, etc.) that would normally melt a synthetic wig. Human hair types vary from rough (lower-end quality) to almost silky-soft (higher-end quality). Grade A human hair wigs (not Grade B, which are less resilient) can even be re-dyed or permed. 100% European hair wigs (as shown in the above photo) offer the finest quality hair that you can buy, on today's market. The texture is outstanding.... they feel exquisite to the touch. They are very durable, and will last longer due to their high quality and cap construction. 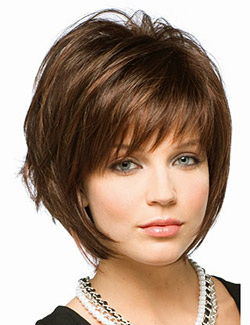 100% Remy human hair wigs are wonderful high-quality wigs as well. Remy human hair is the complete hair strand, including the cuticle, that has not been weakened by "stripping" (a process used by most companies to force unnatural hair direction). Remy hair is also referred to as "virgin hair", or "cut hair". However, since some of the human hair wigs can be a bit more work, some women prefer to go with a more lower maintenance synthetic wig. It's usually a personal decision. Though human hair wigs are more costly, they do tend to last much longer than the synthetic wigs...so you might actually save money in the long run! Some human hair wigs also offer a lace front, meaning that these baby hairs are tied around the lace edges to appear as if the hair was growing from the scalp, thus allowing you to were these lace front wigs completely away from your face- for a completely natural look. You actually trim the lace section (that doesn't have hair on it), to where you own hairline would start.